Kampala, 27th September 2018- On 1 August 2018, the Democratic Republic of Congo (DRC) declared an Ebola Virus Disease (EVD) outbreak in North Kivu Province, close to the DRC-Uganda border. As of 25th September 2018, a total of 151 cases of EVD had been reported to WHO by DRC; of these, 120 are confirmed and 31 are probable; 101 deaths have been reported while an additional 17 suspects were under investigations. In that regard, with 22 at-risk districts identified, MoH and partners have implemented Ebola preparedness and readiness activities to prevent the disease from crossing into Uganda, and to ensure early detection of the disease should it be imported. The activities include coordinating the preparedness activities, strengthening surveillance, capacity building in contact tracing, laboratory diagnostics, Infection Prevention, and Control, clinical management of patients including psycho-social care. Safe and dignified burials, enhanced risk communication and community engagement, and cross-border surveillance are also part of the activities. The WHO Representative in Uganda, Dr Yonas Tegegn Woldemariam, stresses the importance of all these activities in any outbreak preparedness and response. "The only way we have ensured that no alert or suspected case goes undetected is to put in place teams to support the different components of the preparedness. All components are instrumental to an effective response", he says. For instance, border entry screening at all major border points in all the very high-risk districts has been implemented. 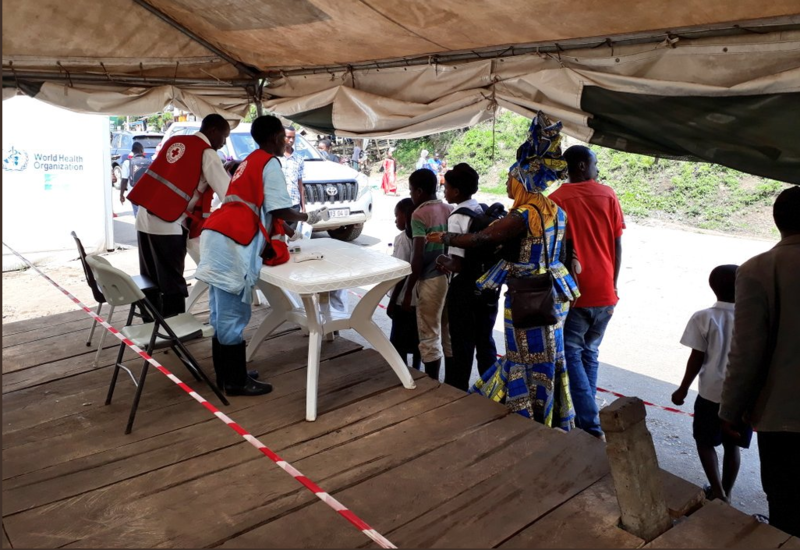 Using volunteers trained by the WHO and Red Cross, and infrared thermometers, everyone crossing into Uganda from DRC is screened for body temperature. The people found with high temperature are further screened for Ebola-like symptoms. On average, the busy border screening points receive 5000 people, however during market days, the number grows tremendously; for instance, Mpondwe border point registers over 20,000 people during the market days- every Tuesday and Friday. An interaction with Peter, a Ugandan businessman at Mpondwe trading centre reveals that some people have two homes- one in Uganda and one in DRC. " "I have my aunties on both sides of the border whom I go to check on frequently and that is what most people here, do", he says. Equally, surveillance and active case search have also been heightened to detect any alert or suspect case. In this regard, with support from WHO, MoH has deployed surveillance experts to work with the district surveillance teams in all the high-risk districts. These engage in daily surveillance activities. 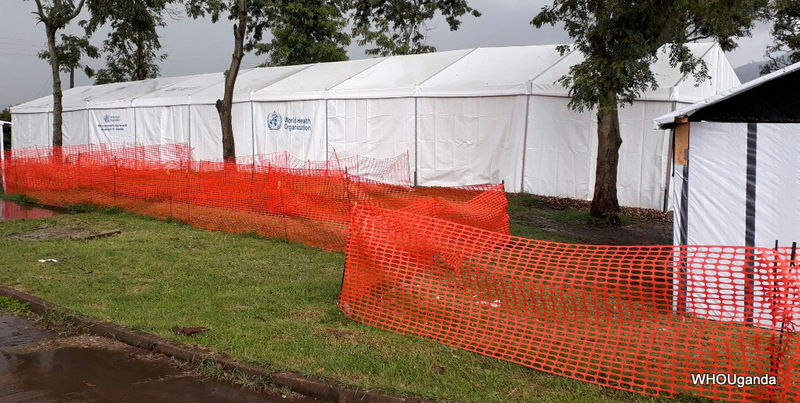 In preparation for any suspected case, Ebola Treatment Units (ETUs) have also been set up at Bundibugyo General Hospital, Bwera Hospital in Kasese, Rwebisengo Health Center in Ntoroko district and another is under construction at Naguru Friendship Hospital in Kampala. These are fully equipped and on standby to manage any alert or suspect or confirmed case. Risk communication and community engagement are also ongoing. Teams are engaged in door to door visits and distribution of Information Education Communication (IEC) material. Further to this, messages are also running on TV and radio to reach the wider public within and outside the high-risk districts. To ensure proper handling of Ebola samples, WHO supported MoH to build the capacity of 40 laboratory technicians in the 5 very high-risk districts in- sample collection, packaging, handling and transportation. Additionally, 19 technicians from the national reference labs were trained in the diagnosis of Ebola virus disease using GeneXpert and Rapid Diagnostic Tests. Similar pieces of training have also been done for the teams deployed to do Infection Prevention and Control, contact tracing, case management and dignified burials. Furthermore, the Ministry of Health is planning vaccination of frontline health workers from the high-risk districts against Ebola. The vaccine is intended to protect health workers who are directly involved in managing patients and are at risk of exposure to infected body fluids, and hence at risk of getting infected with Ebola. 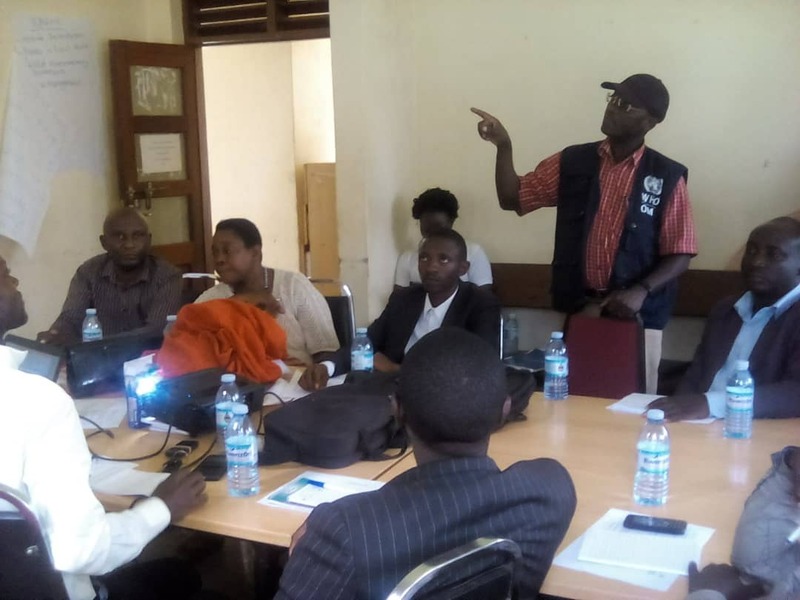 F or an effective response, the MoH is working with other partners including WHO, Infectious Disease Institute, Médecins Sans Frontières (MSF), Uganda Red Cross Society, United Nations Children's Fund (UNICEF), United Nations High Commissioner for Refugees (UNHCR), and World Food Program (WFP). Development partners including the Department for International Development (DFID), Centers for Disease Control and Prevention (CDC) and United States Agency for International Development (USAID) have also supported the preparedness response financially.